Nestled among the stately homes surrounding San Miguel's beautiful Juarez Park, Casa Chiripada del Parque is a gracious three-bedroom, four-bath oasis perfectly suited to the discriminating guest. 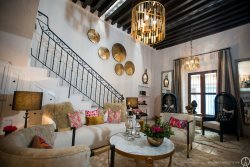 The home, exquisitely furnished with antiques, family heirlooms, books and art, sits just steps away from fine restaurants, galleries, and shopping in the very heart of San Miguel. Classic Mexican colonial touches -- cupolas, arches, stone walls and floors, wood beams, fireplaces, and traditional tiles -- abound in this sophisticated home that blends the warmth and character of old world elegance with modern comforts. Vine-covered stone walls frame the stunning entry up to a spacious outdoor sala with woodburning fireplace overlooking the lush garden, pool and outdoor dining areas. The adjacent private suite (king bed may be converted to twins) comes complete with wetbar, sitting area, smart tv, gas log fireplace, ceiling fan, park views and ensuite bath. An ample breezeway graced by stone arches leads to a large, well-furnished kitchen with all-new appliances and a delightful corner fireplace, as well as a cozy den, bath and grand two-story sala complemented by a wetbar, entertainment center, formal dining area and full garden views. Both the den and the grand sala have gas log fireplaces. An elegant curved cantera staircase leads to a relaxing library loft with leather chaises overlooking both the grand sala and the garden. French doors open to a covered sitting area on a terrace cascading with color in planters running the length of the house. Two bedrooms -- an elegant master suite with king-sized four-poster, and a third bedroom with queen-sized four-poster -- open onto this area, which leads to a larger uncovered terrace featuring magnificent views of the park, hills and San Antonio church. Both rooms have gas log fireplaces, ceiling fans and French doors. One has a smart tv; the other has a tv and DVD player. Chef Rosa welcomes guests with complimentary margaritas and guacamole upon arrival, then further tempts with delicious selections from an extensive menu printed in both Spanish and English. She will cook up to two meals daily if desired, and if guests provide money for groceries. She works 9 a.m. to 3 p.m. weekdays, 9 a.m. to noon on Saturdays, and cleans daily. Guests are expected to tip her a minimum of $7 per person per day; additional gratuity is much appreciated should they so desire! Amenities include bathrobes, high-quality linens, smart tv's, sound system, high-speed wireless internet, Vonage phones for free U.S. calls, hairdryers, down comforters, umbrellas, ceiling fans, garage, washer/dryer, and a water purification system. Books, puzzles, games and movies also are provided for guests' enjoyment. No smoking is allowed except on the upstairs park-side terrace. No children under 18 or pets, please. Sheets are changed weekly; fresh towels are provided twice weekly.